These adorable little bunnies will steal your heart, instead of your garden vegetables! 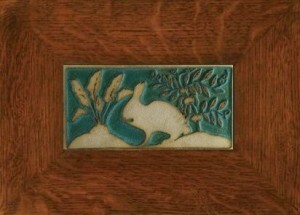 Handmade by our friends at Weaver Tiles in Horton, Michigan. 8" wide x 4" high unframed, also available framed in our 3" Legacy style frame (as shown) or our 2" Oak Park style frame.